McLaren has completed its three tier model strategy with the global reveal of the first in its Sports Series family: the McLaren 570S Coupé. This pure sports car, with driver optimised layout and electrifying performance, shares its DNA with the McLaren Super Series and Ultimate Series that sit above it in the range hierarchy. The Sports Series introduces McLaren race-derived technologies and design values to a new segment and audience. 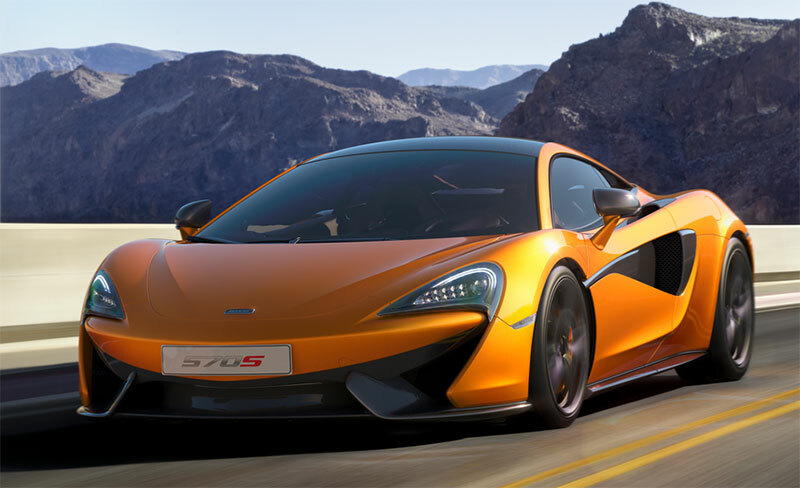 Like every McLaren, the performance of the 570S Coupé is breathtaking. It combines, as its names suggests, a power output of 570PS (562bhp) with light weight construction to give a class leading power-to-weight ratio of 434PS per tonne. The 570S accelerates from 0 to 100km/h (62 mph) in 3.2 seconds, while 200 km/h (124 mph) is reached in just 9.5 seconds with the pace not letting up till the car reaches a top speed of 328 km/h (204mph). The Coupé is the first bodystyle to be shown in the Sports Series, highlighting the latest evolution of the McLaren design philosophy. The ‘shrinkwrapped’, aerodynamically-optimised form will be seen in public for the first time at the 115th New York International Auto Show. The McLaren design team has created a shape of beauty highlighted by details such as the rear flying buttresses that increase downforce as well as adding grace, and complex door tendons that direct additional air to cool the mid-mounted V8 engine. The Sports Series features an evolution of the 3.8-litre V8 twin turbo engine, named M838TE, with 30 percent of components bespoke to the new model. 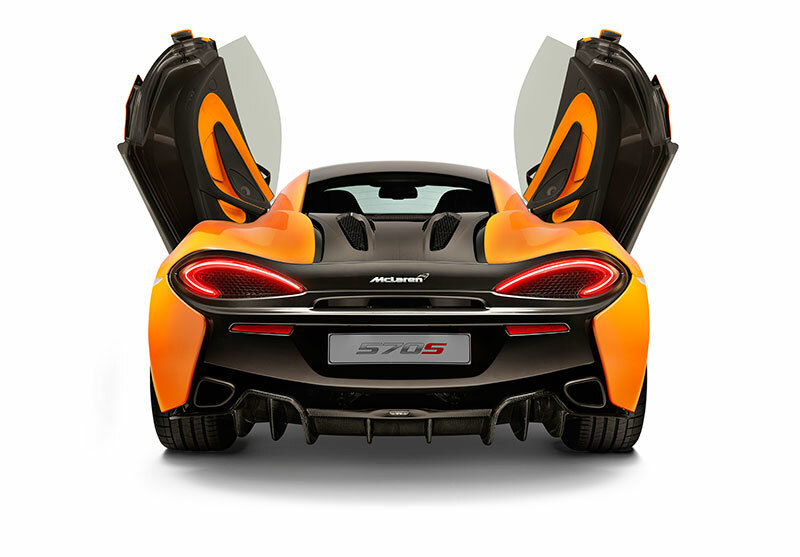 Engineered by McLaren, it produces 570PS (562 bhp) at 7,400 rpm, and 600Nm (443 lb ft) of torque at 5,000-6,500 rpm. Power is delivered through a seven-speed SSG transmission, and transferred to the road through the rear wheels. This power is brought under control with standard-fit carbon ceramic brakes, fitted behind a newly designed range of forged alloy wheel options with P Zero™ Corsa tyres as standard from McLaren technical partner, Pirelli – 225/35/R19 on the front and 285/35/R20 on the rear. Minimised weight and a turbocharged engine doesn’t just bring great performance. The 570S also delivers excellent fuel efficiency and emissions for car that is also a member of the 200mph club, with fuel economy of 25.5mpg on the EU combined cycle, and emissions of 258g/km. For the US market, this means exemption from gas guzzler tax. Flying buttresses at the rear of the teardrop-shaped glasshouse form part of the aero package, directing air over the shoulderline of the 570S and across the rear deck aiding heat evacuation from the exposed engine bay and increasing downforce. Super-formed aluminium rear fenders ensure clean air is delivered to the fixed rear spoiler, again maximising downforce. The rear of the car is clean and uncluttered, with LED light blade rear lamps which follow the form of the sculpted panels. The rear of the vehicle features an aluminium mesh allowing effective heat evacuation as well as a view into the engine bay. This sits below a concave rear window, another signature Sports Series Coupé design cue. The twin exhausts exit below the rear bumper, either side of a newly designed and highly intricate rear diffuser.